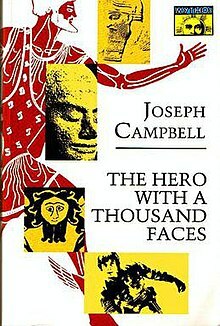 The Hero with a Thousand Faces (first published in 1949) is a work of comparative mythology by Joseph Campbell. In this book, Campbell discusses his theory of the mythological structure of the journey of the archetypal hero found in world myths. Since the publication of The Hero with a Thousand Faces, Campbell's theory has been consciously applied by a wide variety of modern writers and artists. Filmmaker George Lucas acknowledged Campbell's theory in mythology, and its influence on the Star Wars films. In laying out the monomyth, Campbell describes a number of stages or steps along this journey. "The hero's journey" begins in the ordinary world. He must depart from the ordinary world, when he receives a call to adventure. With the help of a mentor, the hero will cross a guarded threshold, leading him to a supernatural world, where familiar laws and order do not apply. There, the hero will embark on a road of trials, where he is tested along the way. The archetypal hero is sometimes assisted by allies. As the hero faces the ordeal, he encounters the greatest challenge of the journey. Upon rising to the challenge, the hero will receive a reward, or boon. Campbell's theory of the monomyth continues with the inclusion of a metaphorical death and resurrection. The hero must then decide to return with this boon to the ordinary world. The hero then faces more trials on the road back. Upon the hero's return, the boon or gift may be used to improve the hero's ordinary world, in what Campbell calls, the application of the boon. While many myths do seem to follow the outline of Campbell's monomyth, there is some variance in the inclusion and sequence of some of the stages. Still, there is an abundance of literature and folklore that follows the motif of the archetypal narrative, paralleling the more general steps of "Departure" (sometimes called Separation), "Initiation", and "Return". "Departure" deals with the hero venturing forth on the quest, including the call to adventure. "Initiation" refers to the hero's adventures that will test him along the way. The last part of the monomyth is the "Return", which follows the hero's journey home. Campbell studied mythological and literary classics including the stories of Osiris, Prometheus, the Buddha, Moses, Mohammed, and Jesus. Campbell's book cites the similarities of the stories, and references them as he breaks down the structure of the monomyth. The book includes a discussion of "the hero's journey" by using the Freudian concepts popular in the 1940s and 1950s. Campbell's theory incorporates a mixture of Jungian archetypes, unconscious forces, and Arnold van Gennep's structuring of rites of passage rituals to provide some illumination. "The hero's journey" continues to influence artists and intellectuals in contemporary arts and culture, suggesting a basic usefulness for Campbell's insights beyond mid-20th century forms of analysis. Campbell used the work of early 20th century theorists to develop his model of the hero (see also structuralism), including Freud (particularly the Oedipus complex), Carl Jung (archetypal figures and the collective unconscious), and Arnold Van Gennep . Van Gennep contributed the concept of there being three stages of The Rites of Passage. Campbell translated this into Separation, Initiation and Return. He also looked to the work of psychologist Otto Rank and ethnographers James George Frazer and Franz Boas. Campbell was a noted scholar of James Joyce, having co-authored A Skeleton Key to Finnegans Wake with Henry Morton Robinson. Campbell borrowed the term monomyth from Joyce's Finnegans Wake. In addition, Joyce's Ulysses was also highly influential in the structuring of the archetypal motif. The book was originally published by the Bollingen Foundation through Pantheon Press as the seventeenth title in the Bollingen Series. This series was taken over by Princeton University Press, who published the book through 2006. 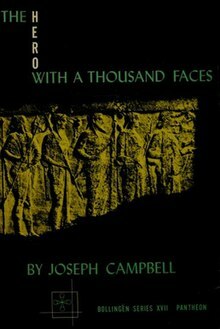 Originally issued in 1949 and revised by Campbell in 1968, The Hero with a Thousand Faces has been reprinted a number of times. Reprints issued after the release of Star Wars in 1977 used the image of Mark Hamill as Luke Skywalker on the cover. Princeton University Press issued a commemorative printing of the second edition in 2004 on the occasion of the joint centennial of Campbell's birth and the Press's founding with an added foreword by Clarissa Pinkola Estés. The Hero with a Thousand Faces has been translated into over twenty languages, including Spanish, Portuguese, French, German, Italian, Japanese, Korean, Chinese (simplified and traditional), Turkish, Dutch, Greek, Danish, Norwegian, Persian, Polish, Romanian, Czech, Croatian, Serbian, Slovenian, Russian, Hungarian, Bulgarian and Hebrew, and has sold well over a million copies worldwide. The artist is meant to put the objects of this world together in such a way that through them you will experience that light, that radiance which is the light of our consciousness and which all things both hide and, when properly looked upon, reveal. The hero's journey is one of the universal patterns through which that radiance shows brightly. What I think is that a good life is one hero journey after another. Over and over again, you are called to the realm of adventure, you are called to new horizons. Each time, there is the same problem: do I dare? And then if you do dare, the dangers are there, and the help also, and the fulfillment or the fiasco. There's always the possibility of a fiasco. But there's also the possibility of bliss. The Hero with a Thousand Faces has influenced a number of artists, filmmakers, musicians, and poets. Some of these figures include Bob Dylan, George Lucas, and Jim Morrison. Additionally, Mickey Hart, Bob Weir, and Jerry Garcia of the Grateful Dead had long noted Campbell's influence and participated in a seminar with Campbell in 1986, entitled "From Ritual to Rapture". Jenova Chen, lead designer at thatgamecompany, also cites The Hero's Journey as the primary inspiration for the PlayStation 3 game Journey (2012). Mark Rosewater, head designer of the Magic: The Gathering trading card game, cites The Hero's Journey as a major inspiration for "The Weatherlight Saga", an epic story arc that went from 1997 to 2001, and spanned multiple card sets, comic books, and novels. Christopher Vogler, a Hollywood film producer and writer, wrote a memo for Disney Studios on the use of The Hero with a Thousand Faces as a guide for scriptwriters; this memo influenced the creation of such films as Aladdin (1992), The Lion King (1994), and Beauty and the Beast (1991). Vogler later expanded the memo and published it as the book The Writer's Journey: Mythic Structure For Writers, which became the inspiration for a number of successful Hollywood films and is believed to have been used in the development of the Matrix series. "I think I got about half way through The Hero with a Thousand Faces and found myself thinking if this is true—I don't want to know. I really would rather not know this stuff. I’d rather do it because it's true and because I accidentally wind up creating something that falls into this pattern than be told what the pattern is." Many scholars and reviewers have noted how closely J. K. Rowling's popular Harry Potter books hewed to the monomyth schema. The sixth and final season of Lost recognizes Campbell's theories on the hero. During one of the bonus features, the makers of the series discuss the journey of the main characters and how each is a hero in their own way. Before each little segment of this particular feature, they quote Campbell and then expound on that particular quote by discussing the various characters. ^ Pathways to Bliss: Mythology and Personal Transformation, Edited by David Kudler. Novato, California: New World Library, 2004, pp. 132, 133. ^ "Joseph Campbell Timeline". Pacifica Graduate Institute. Archived from the original on April 30, 2011. ^ Sharon Black, "The Magic of Harry Potter: Symbols and Heroes of Fantasy," Children‘s Literature in Education, Springer Netherlands, Volume 34, Number 3 / September, 2003, pp. 237–247, ISSN 0045-6713; Patrick Shannon, "Harry Potter as Classic Myth"; Deborah De Rosa, "Wizardly Challenges to, and Affirmations of the Initiation Paradigm in Harry Potter," Critical Perspectives on Harry Potter, Elizabeth Heileman, ed. Routledge, 2002, pp 163–183—there are numerous similar references. Leeming, David Adams (1998) . Mythology; Journey of the Hero. Oxford University Press.